Been at the club since season 1999 and improves with every year. Shows great promise and is difficult to get out (especially when his dad is umpiring). Lover of fast cars and slow women. Runs just about anyone out when batting and has been known to throw the ball at supersonic speed (straight over the keeper). 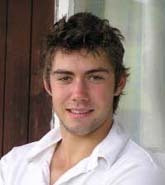 One of the up and coming players had a very good 2009 and went on to represent the B&DCA. Pies disguised as leg spin are most welcome at early season nets however - plenty of improvement still in this department!